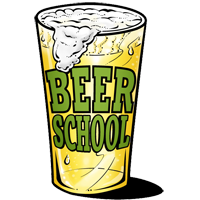 beer school » Blog Archive » KTHX… and we’re off! I want to thank everyone for making their way to the event that marked the beginning of Strong Beer Month and drinking my first commercial beer. 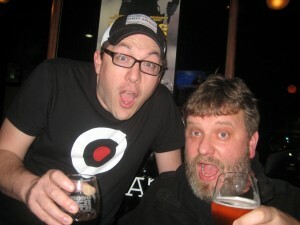 Chad and McDole (of the Brewing Network) were already there when I arrived. and that was just the beginning of wave of all of my friends. Richard from Elizabeth Street Brewing (who has a real fake pub in his basement) brought his kids who helped ring the bell. his beer is really good in double double form. I can’t really describe how all this felt. even hung over like hell it’s still an amazing buzz. I’m sure this gets old at some point. but I don’t know how it could. here are some highlights: Tasty egging me on that I need to brew more. the girl who lost her mind when I told her I brewed the beer she was drinking. my friends saying “I really like your beer!” and then ordering another one. 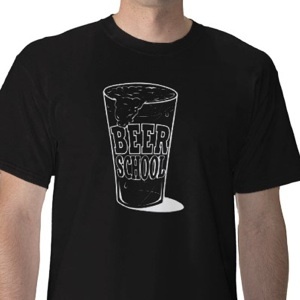 hearing random people saying “I love this!” and finally punching the “get a free glass score card” for my beer. I don’t think I took enough pictures. but here’s some of the ones I managed to take. and that’s just the first day. there’s a whole month left. GET HERE!